Power up your day with this delicious salad packed with veggies, chicken, and Cabot Cheddar. Top it with the tangy, fresh yogurt dill dressing and you're ready to conquer the world. BRING several inches of water to a boil in a large saucepan fitted with a steamer basket. ADD green beans, cover and steam until the green beans are crisp tender, 3 to 4 minutes. Remove from steamer and let cool. WHISK yogurt, mayonnaise, shallot, dill, vinegar, salt and pepper in a large salad bowl. Add greens and toss to coat. Mound greens on two large plates. Top with the green beans, chick peas, tomatoes, chicken and cheddar. To make ahead: prepare dressing up to three days in advance. This salad really is powerful! Packed full of greens and protein, what's not to love…..I added some additional veggies that I just love and even threw in some fresh strawberries and it was awesome. 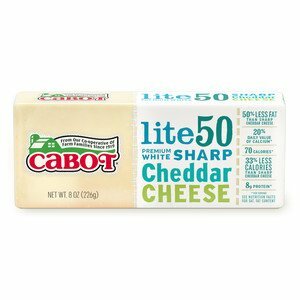 Sharp Lite50 cheddar tastes great too with less calories than our other favorite Seriously Sharp….great recipe!